With tomorrow being the date where Paul Pasqualoni and selected players meet with the media to look ahead to Thursday’s season opener against Towson I thought it would be the perfect time to give my thoughts on the recently-completed preseason camp. First, there’s a chance that the team captains will be announced tomorrow. Here are my guesses on who could get the nod. On offense I would go with junior quarterback Chandler Whitmer and senior offensive guard Steve Greene while senior defensive tackle Shamar Stephen and junior linebacker Yawin Smallwood would be my picks on defense. As for a special-teams captain, that’s a tougher call and If they opt to elect one just for special teams perhaps punter Cole Wagner would be the best pick or they'll take somebody like a Byron Jones who figures to see plenty of time on the return units. 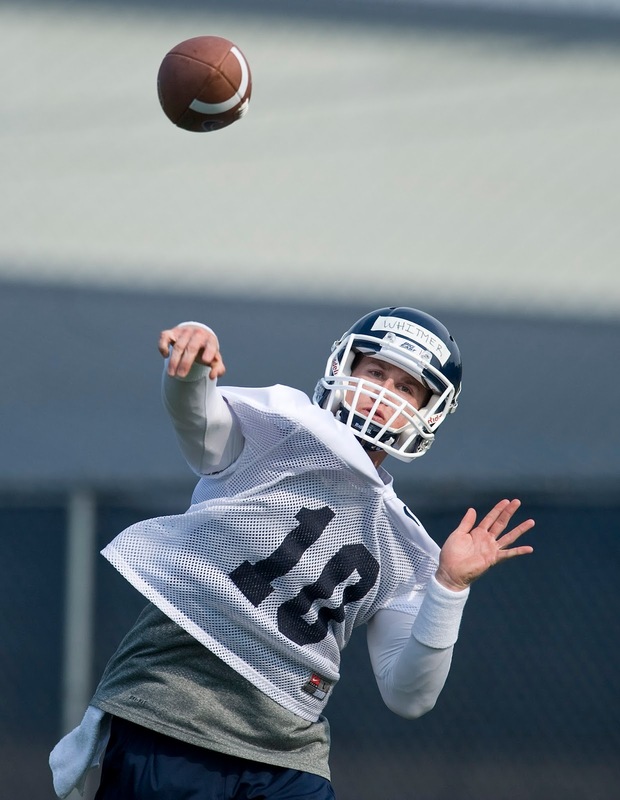 Quarterback: I’ve been a bit underwhelmed by what I’ve seen from Whitmer. He’s still been turnover prone and he will need to perform at a higher level in the games than he did in the practices I witnessed. Casey Cochran struggled even more with turnovers and about as angry as I saw Paul Pasqualoni in the preseason is when he badly misfired on a drill with no defense. Cochran is an extremely bright kid and that is what led to him winning the No. 2 quarterback spot. Nobody has thrown the ball better than freshman Tim Boyle in camp but in my opinion UConn would prefer to allow Boyle to redshirt this season so he could have three years as the starter once Whitmer graduated. Fellow freshman Kivon Taylor has shown the ability to make plays with his arm and feet so the Huskies are in good shape at this position for years to come. Running back: Lyle McCombs is another returning offensive center piece who didn’t get very much accomplished when I was there. With T.J. Weist now calling the plays, I have a hunch that the days of having the undersized McCombs run between the tackles play after play could be coming to an end. I think multiple running backs could get the ball this season. Martin Hyppolite has been the most impressive tailback I have seen and freshman Josh Marriner looks like he could be a player while Max DeLorenzo, who is listed as the No. 2 tailback, brings physicality to the position. The fullbacks have looked pretty good to me. Jazzmar Clax has shown a physical running style that I would imagine could carry over to the blocking department. Freshman Matt Walsh is another physical player who has displayed an ability to catch the ball which likely pushed him over the top and made him the starter. Receiver: With Geremy Davis and Shakim Phillips back, the Huskies have a pair of big, strong athletic receivers and I expect big seasons from both of them. Davis has been outstanding throughout camp as I can’t remember him having a bad day and he has made a ton of plays. Phillips has been a little more up and down but still has made a jump from last season. After that it is kind of hard to predict. Deshon Foxx was outstanding in spring camp but was not as noticeable during summer drills. One of the most pleasant surprises has been junior Kamal Abrams who has caught everything thrown his way. Freshmen Brian Lemelle (who will be the No. 1 punt returner) and Dhameer Bradley have had their moments of brilliance. Tight end: Injuries make this position hard to read. Sean McQuillan looked pretty good but he suffered a concussion after a big hit from Taylor Mack at the last practice we were able to watch. We should find out more on his availability for the Towson game tomorrow. Spencer Parker has missed much of camp so it’s hard to get a read on him. That leaves a pair of true freshmen (Mike Boland and Tommy Myers). Boland was a two-way lineman in high school who brings physicality to the position but can he catch the ball well enough to make an impact as a true freshman? For Myers, it is the complete opposite as he is an outstanding receiver but needs to prove he can block at the collegiate level. Offensive line: The only time you can really grade the line is during the 11 on 11 drills and I did not see much push especially from the middle of the line when the No. 1 offense squared off with the No. 1 defense. Considering the experience UConn has at left guard with Greene and left tackle with Jimmy Bennett, that should be strength of the offense. Alex Mateas was named the starter at center and that is a position that needs to show a significant improvement this season. On the right side Gus Cruz and Kevin Friend began summer camp working with the second team but have spent most of the practices as the starters. I thought Tyler Samra and Kyle Schafenacker might push their way into starting positions but they will start the year as second-string guards. Defensive line: No position has been as impressive during the practices I attended. The duo of Stephen and Julian Campenni could be an imposing 1-2 punch at defensive tackle. I thought Tim Willman might see time at DT but with the way Campenni worked in the offseason to prepare for his sophomore season, Willman has played exclusively at defensive end and might have been the best defensive player I’ve seen not named Yawin Smallwood. On the other side, Jesse Joseph is back and is a premier run-stuffing defensive end that can also be a disruptive force on the pass rush. Joseph has been nicked up in camp so we’ll have to see how long it takes him to get back to 100 percent. With Angelo Pruitt, former starting fullback Reuben Frank and last year’s top true freshman E.J. Norris there is plenty of depth at DE. At tackle redshirt freshman Mikal Myers has made a ton of plays. I don’t know if the pass rush will be as impactful with the departure of Trevardo Williams but this could be one of the most rugged defensive lines in the ACC. Linebackers: It all starts with Smallwood who is just a sensational player who has stepped up in the leadership department. He will be flanked by a pair of fast, aggressive players in Ryan Donohue and Graham Stewart. They have big shoes to fill following the graduation of Sio Moore and Jory Johnson and look very capable of doing just fine. There are plenty of young prospects looking to make an impact led by Jefferson Ashiru and Marquise Vann. Although he is not on the two-deep chart, Omaine Stephens has made a bunch of plays in camp. Cornerbacks: So far, so good. There figured to be a drop off after the graduation of Dwayne Gratz and Blidi Wreh-Wilson, who could end up starting as rookies with Jacksonville and Tennessee but Byron Jones and Taylor Mack have been rock solid throughout camp. UConn will certainly be more physical at the position and they could hold the key to UConn’s defense. Jhavon Williams is a redshirt freshman who looked pretty good in the 2012 summer camp and seems to have a bright future. True freshman Javon Hadley is another talented youngster while David Stevenson, one of the stars of the 2012 spring game, is also in the mix at the position. 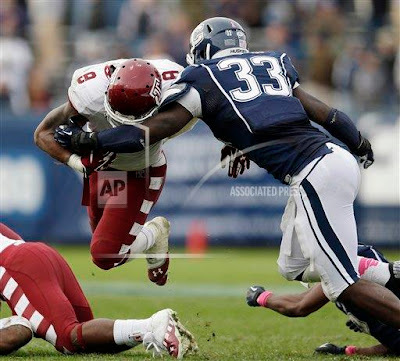 Safeties: Ty-Meer Brown is a top-notch athlete and player who is a legit NFL prospect. The other starting spot figures to be handled by rangy and athletic redshirt freshman Obi Melifonwu. Pasqualoni has been talking up Melifonwu who runs in the 4.5 range in the 40-yard dash and has a 41-inch vertical leap. He is very raw especially in pass defense so a lot of eyes will be on him especially if Andrew Adams misses significant time following a shoulder injury suffered in practice. Wilbert Lee has had an outstanding camp. 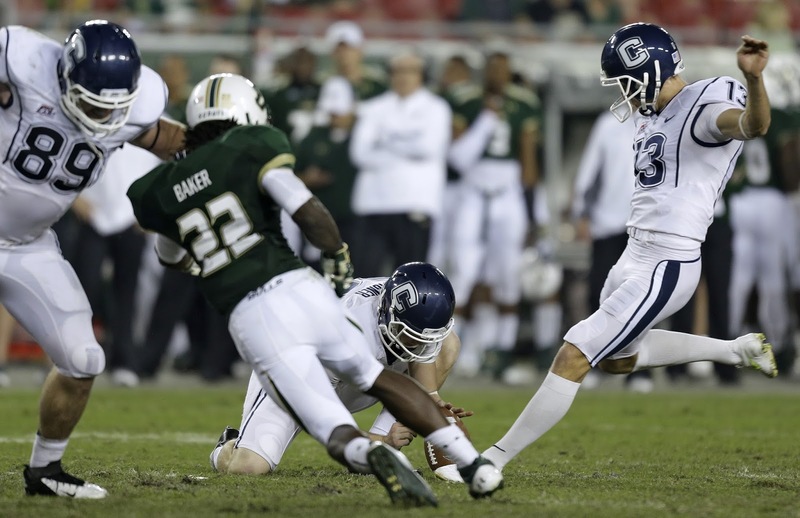 Special teams: Chad Christen at kicker and Wagner at punter are seniors with big legs who have looked very good in camp. Kickoffs will be interesting. UConn would like to redshirt Bobby Puyol and I haven’t seen Christen kickoff during camp. I expect to see plenty of freshmen on the return units so it will be interesting to see how those units fare. In the return game, Lemelle will be the punt returner while Phillips could be a big-play threat on kickoff returns.